If there's anything I've learned with the practice of Tarot is that there's always space to go back to the beginning, right down to basics, and find something new in the journey. Every time I get a new deck it feels like that. I feel like a newbie, just starting out, in awe of the images and paying close attention to all the ways the images move and shake me. Every time. I've been waiting for that feeling to fade but it hasn't, not once. I want to hold on to that feeling. I recently bought Astrology for Yourself to get a bit deeper into my own personal astrology and ran across Tarot for Yourself by Mary K Greer. While not a beginner, I was curious and it kept nagging at me. What would it look like to start over? So I got the e-book version and decided to meet the tarot anew all over again. My introduction to tarot was not at all structured, most of it self-taught and intuition based so I'm intrigued by the structure of a workbook. I don't expect to get through this whole thing quickly, I'll take it slow and make notes here and in my journal as I go along. I also re-calculated my Personality, Soul, and Year Card numbers. These are also referred to as Birth Cards. The answers didn't change of course, but it was nice to do the math by hand rather than toss them into an online generator. My Personality Card is generated from the number 13, and so Death (XIII). My Soul Card is generated from the number 4, and so The Emperor (IV). My Year Card for 2018 is generated from the number 14, and so Temperance (XIV). Wanna do this for yourself? (for ex: January 3rd, 1911 would be: 01+03+1911 = 16 so your cards would be both 16 & 7). (for ex: January 3rd, 2018 would be: 01+03+2018= 6; remember not to reduce to the smaller number if you get a number larger than 10). Or toss them into an online generator, because why not? Personally, I use the Birth Cards to evaluate a deck's art. 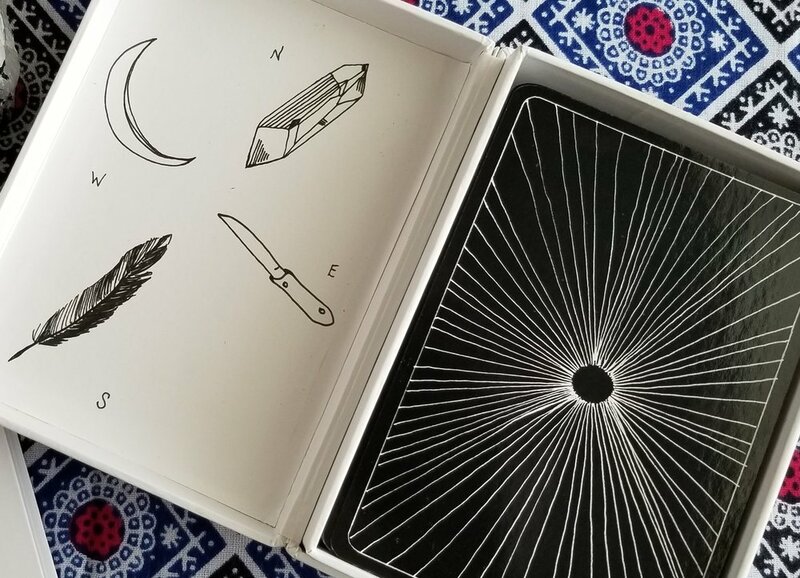 My Birth cards act as one of the make or break points for connecting with a tarot deck. For example, despite an initially difficult relationship, I knew the Mary-El and I would reunite based almost solely on its truly boss portrayal of The Emperor. I use the Year card as a meditative guide to help set intentions for the year. My specific intentions, Peace & Nourishment, were inspired by the energy of the Temperance card. When I first got into Tarot, I needed it to be a primary divination practice. Instead, it taught me the power of trusting my own perspective. Now I understand that tarot is an intuitive mirror for the self. What do you feel is the purpose of Tarot cards? It is a source of affirmation. It acts as vessel and amplifier for messages and lessons we need to hear. I want to continue learning to better trust my intuition. We could all bear to believe ourselves more, affirm that what we feel, see, and hear in the world is the truth. Faced with a world that does everything it can to force us into palatable shapes primed for exploitation, shaping our own perspectives and living our own truths as whole beings and self-affirming souls is an important push-back strategy. How would you answer these three questions at this stage of your tarot journey?